Raised toilet seats are made for the elderly or the disabled. By elevating the toilet seat, it is easier for someone with limited mobility to sit down and stand back up after using the bathroom. A toilet seat riser can be installed easily, and many of them lock on to the existing toilet seat. Allegro Medical offers a wide array of different kinds of raised or handicapped toilet seats, so you can find the size and height that is right for your needs and the configuration of your bathroom. 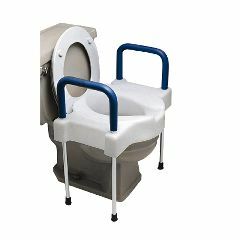 Extra Wide Tall-Ette Elevated Toilet Seat w/ Legs - Adds 4"
Elevated Toilet Seat with Lid - 2", 4", or 6"
Carex Elevated Toilet Seat - 5"
Tall-ette Arthro Elevated Toilet Seat - 4"
Vinyl Cushion Toilet Seat - 2" or 4"